Rzewski's "North American Ballads" is a set of four pieces based on the union tunes These pieces are an outgrowth of the "new populism", which abandons the serialism and sought to be understood by a larger public. Although his melodies come from popular culture, he handles them in a strict classical formal structure with the technique of a sophisticated Baroque contrapuntist, yet in a late-twentieth century manner. Rzewskis chromatic settings of the diatonic material, especially the use of half-step relationships in both vertical and linear perspectives is one of the most striking aspects in this set of four pieces. His second piece of the set, "which side are you on?" shows a wide divergence of characters, such as minimalism, collage-quotationalism and neo-Romanticism. Its highly complex polymodal contrapuntal style contrasts and compliments the exceptionally simple tune. Rzewskis use of symmetry is not only presented in the four-note motific cell  but also in its formal structure in its tonal plan. 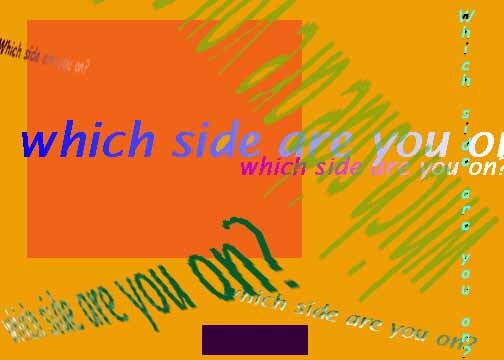 The large structure of "Which side are you on?" is in a Sonata-Rondo form. (See Ex. 1) The C section is the center of the arch-shaped structure. On each side of C there are two polymodal A sections. The arch is completed by two diatonic A section appearances at the beginning and the end. The segments are labeled 1-8. 7 and 8 is the repetition of 5 and 6 in the original tune. Note that segment 3, 4 and 8 are in T2, which is F# minor, the Dominant of home key B minor. The pattern of the transposition levels is either 2 semitones or multiples of 2 semitones apart except for 6. In fact, the transposition levels compress itself with a multiple of 2 semitones in contrary motion within an octave. The distance between each transposition becomes smaller in arch shape until it meets the middle of the octave, which is the tritone, T6. Its symmetrical transposition plan in this passage creates an arch shape. (See Ex. 3). The tonal plan for the rest of the sections are even more intriguing. Rzewski uses submediant as a mean of substituting dominants. the B section in exposition is in G minor, which is submediant of its home key B. After a brief statement of the quotation A2, the development moves to the key of G#. This is a good example of the linear use of the half-step relationship. (See Ex. 4) The return of the B section in recapitulation, however, is not in its original key of B but in C. Why is this not in its original key like the traditional sonata form? This question again leads us to the linear half-step key relations. This is a monothematic piece. The only way to produce contrast between A and B section is through modification of tonalities and textures. Rzewski conceived this successfully by using the key of C as a linear presentation the minor 2nd key relations. C functions as an upper-neighbor gesture between section A3 and A4. It also creates a Dominant-Tonic relationship as in the traditional sonata form. G (B section in Exposition) is the dominant of C (B section in Recapitulation). (See Ex. 4). Therefore, in a way the B section is in its "relatively home key". Meanwhile, the texture changes from extremely polyphonic to monophonic; the constantly changing of metersfinally calms down to static 4/4time. The tune is now presented in a mechanical minimalistic style in order to set up for the grand finale. Rzewski juxtaposes diatonic materials in a chromatic setting both vertically and linearly. It makes a clear statement as early as the very beginning this piece. The entrance of tenor voice is clearly in Eb. The statement of the tune in the bass is, however, in E. presents. A vertical example is shown in mm22-25, the transition to A1, the primal presentation of the tune. The top voice remains in Bb minor from mm15-21 while the bass moves on to a new key, B minor, in which the union tune will be presented. This is an excellent transition by using minor 2nd relationship vertically to connect two sections with distant key relations. The half-step interplay of  and  continues to be a way of representing the symbolic meaning of the title. The tune has four phrases and the fourth phrase is the repetition of the third. Each phrase contains two segments. The fifth segment in the original tune is B-B-D-E-F# , which has a major mode implication. The sixth segment answers with a descending F#-F#-E-C#-B (a set type of ), which is in a minor mode. We should not leave out the fourth segment, which contains both D and C#. D is used in ascending purposes and C# only appears in the descending phrases. The ascending segment is likely to be a question and the descending segment seems to be the resolution of the question. (See Ex. 5) However, the text "which side are you on?" is set in both ascending and descending segments. The uncertainty of major-minor mode and the question-answer confusion further suggest the title of this tune--"which side are you on?" Rzewski takes this matter one step further. He has altered the D to C# in the fifth segment both the ascending (fifth) and descending (sixth) segment share the same pitches, as well as the set type  . 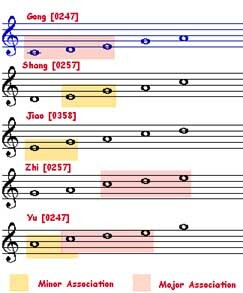 Because of this change, four-note group appears five times in the quotations. This set becomes the most important motific cell that ties the whole piece together. 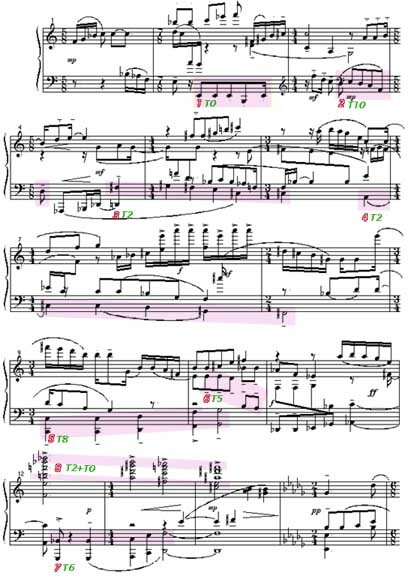 It seems as if he solved the conflict by staying with only the minor mode, however, Rzewski recreates conflicts by using  in a descending context instead of ascending as it is in the original. A similar example can be found in mm86-87, which combines two set types together with A-B as a pivot point. The overlap starts with  in B (minor). The A-B in measure 86 becomes the ending of  as well as the starting point for . Again, Rzewski altered the role of the ascending and descending segments. The "question" turns into the "answer", however, with the set type of the "question". The confusion makes it even harder to decide which side we are on. 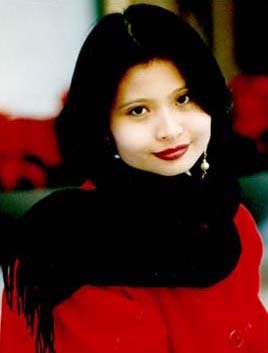 BM, 1995, Oberlin Conservatory of Music. Artist Diploma, 1997, Oberlin Conservatory of Music. MM, 1999, The Juilliard School. DMA in progress, Moores School of Music, University of Houston. Sedmara Rutstein (Oberlin Conservatory of Music). Jerome Lowenthal (The Juilliard School).